~in my sketchbook~ Eleni and I recently shared some pencil time, and I was given strict orders to not cross the middle line. I wouldn't dream of disturbing the beauty on her side. She quickly looked away and got busy coloring again every time I caught her gazing at what I was doing. So sweet. She already has a little artistic pride. ~on my sewing shelves~ All along the back of my long sewing table, I have this 1"x6" plank of wood held up off the table by a few fabric-covered bricks. Works out great. Know what else works out great? These gallon-size clear jars for thread and such. Much better than bags spilling on the floor and getting dusty. Not that I would know anything about that. 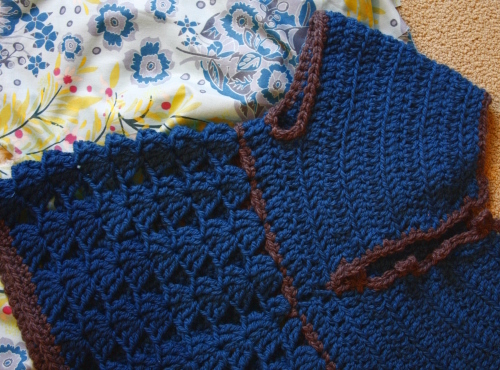 ~recently unhooked~ This sweater for Eleni that will go over her Christmas dress (which will be made from that fabric there which is part of Good Folks, which I will show you completely very soon. I'm going to make a dress length version of the Prairie Blouse pattern from my book.) For the sweet sweater, I got the pattern download from here, and it was very quick and simple to work up. It's still waiting for 4 covered buttons for the back loops. I manage to forget to buy the button kit every stinkin time I go the the sewing shop. Of course I already have every other size that I don't need in the studio. ~on my hook~ Same as above, but for Isabela. Its been moving a bit slower, because each night I settle into my nest I nod off, just about 10 trebles in. Every time. ~touching the ceiling~ I don't know why I always want it to touch the ceiling, it just makes me happy. Now that Juliana has gotten too big to be lifted by Jeff to put the star on we just let him do it while Juliana and I fuss opposite commands of which way to tweak it. There are considerably less candy canes on the tree than there were 5 days ago. ~on our branches~ This is amazing. We have a snowday today. We usually have to wait all through the winter to get some snow around here. Snowplay began at 6am this morning, and we now have movies and popcorn with one set of neighbors going in one room, oversleeping (read teenage) slumberers with another set of friends in another room, some still snowbooted children having cocoa on the back porch, and I've got one on the computer next to me. Last count, 9 kids in the house. Oh, ten. Sorry baby. ~at my feet~ Always. And even more so these days. Did any of you other expectant or already delivered mommy/doggie mommies out there notice a change in your pup while you were pregnant? Leo seems to think he's needed in the incubation process. If I move just 6 inches away, he'll come with me. He's already a doting motherbear. Good boy. OK, that's it, I'm coming over with the oatmeal scones. Get the tea ready, girlfriend! I'm hoping you post a picture or your girls wearing those cute sweaters once they recieve them. I might have to expand my crochetting horizon's and try an adult sized one. :) Thanks for sharing its source. So very lovely! Thanks for inviting us! I'm not a mom (to humans anyway) but my Leo follows me everywhere! My female lab, Lucy, could care less where I am in the house. Thanks for letting us take a peek around your warm, happy home. I wish it could be Christmas every day in your house (so long as I could share the rug with your puppy). It looks wonderful chez Anna Maria! Oh, yes, more tea please! Thanks for inviting us, I love these homely posts. By the way, your tree looks beautiful! I love the multiple colors of the walls in your den, mixed with the combination of fabrics. Looks perfect with your tree, covered in many kid-made ornaments- my favorite kind! Just bought your book. Tantalized by the pictures, and hope to whip up a couple of aprons for the new year. Maybe a piece of artwork, as well. Your tree is incredible. I love the young artist's drawing ! Anna Maria I always enjoy reading your blog for your beautiful designs but I think I enjoy more hearing about your family. I don't know...it makes me feel homey. 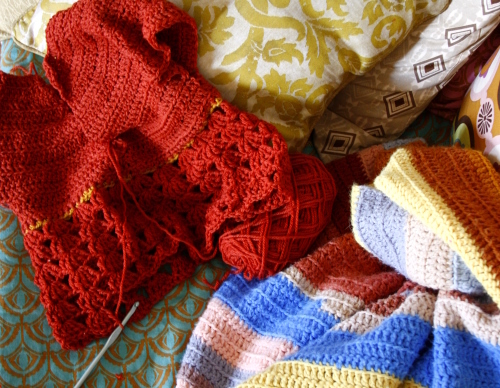 I want to get off the computer and go knit under a blanket with some tea. Oh and I can totally appreciate the doting doggie. I had a furry shadow through two pregnancies! Sweet post Anna Maria! My dogs, Polly-a foundling--we believe she is part beagle, part yellow lab, never leaves my side, same with my Heidi, a 9 yr old black lab. As far as I know I'm not pregnant, my youngest son is 13 but I look at it as a show of girl power--I have three sons and a husband. Not a lot of pink around here! So my girls stick to close to me. I love the pillow on the chair by your tree! It's fabulous. Hey Anna! My dog Buckley seemed to "know" that I was pregnant long before I was showing. He would suddenly snuggle up by my abdomen. Oh, I almost forgot how Sid(my doxie) quietly followed me everywhere! Even after Cole was born Sid faithfully followed Cole everywhere! Every mid-night feeding Sid would keep my feet warm:) So amazing! Congrats by the way!!!! Your home looks very cozy and holiday ready. My dog AND my cats glued themselves to me while I was pregnant. It was very sweet. What a super post. 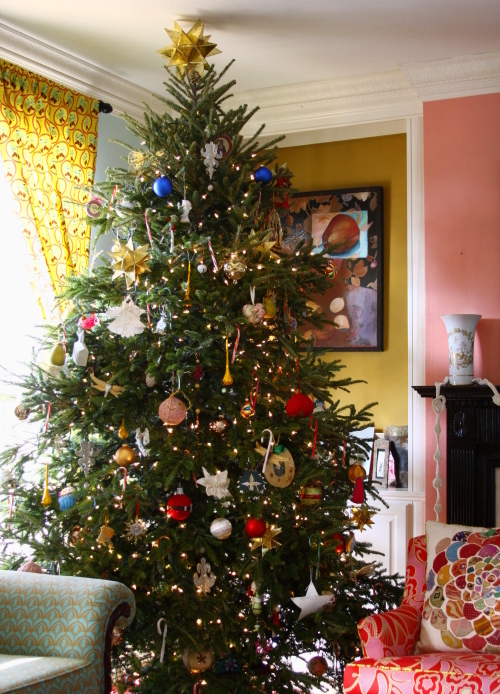 Christmas trees should always touch the ceiling! That's so sweet about Leo. I am about 15 weeks pregnant and I have a little chihuahua, Dutch, who has become an even better little snuggler. Its lovely to have a furry little warm body to cuddle up with you when you feel lousy or just plain tired. I just found your blog this week and I love love love it!!! you have a beautiful home and family and are extremely talented! thank you for sharing and I will be back often!!! I didn't notice a great change in my English Bulldog while I was pregnant, though she already followed me around every where I went. But, my good friend's boxer wouldn't let me sit alone when I was visiting. Every time I sat down, Ali was always on my lap. Imagine a 8 month pregnant lady and a Boxer on her lap, quite a funny sight! My tree touches the ceiling too! I love it. 9 kids in the house are you crazy? More power to you! Yes when I was preggers my dog followed me everywhere and hovered over me all thetime. It was so sweet! Enter to win some Amy Butler fabric if you haven't already! hey you cheered me up today, so I just stopped by to say thanks. I put some links to you on my little blog. My 14yo baby is sleeping in, as usual. The cat, who loves him most, is sleeping outside his (shut) door. Your tree is breathtaking!! Thank you for sharing your wonderful Christmas magic! 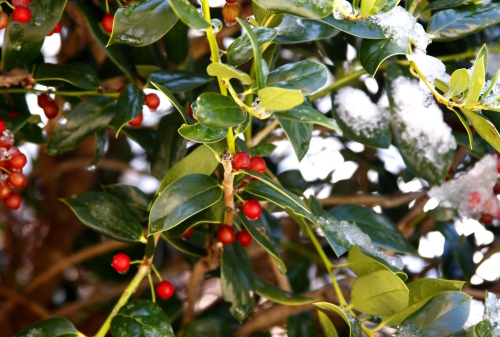 Your tree is beautiful, thank you for sharing! Your tree looks wonderfully cozy! And I love the work of your young artist! Thank you for sharing your lovely pictures. She said he only acts that way with expectant mothers. Curious, isn't it?! Glad you've got the extra company. Such a sweet watch dog. I love these glimpses into your domicile! And yes, I would love more tea, Earl Grey, with lemon and honey please. I think yellow Labs just have that leaning instinct. Watch out for the drool! Love the crochet sweaters. So sweet with that fabric. Hot chocolate sounds real good right about now. We don't have snow but it is cold enough for a fire in the fireplace. I've been enjoying your blog for awhile, but have never commented before. I just have to tell you that I have a daughter named Eleni also. My mother's family is from Greece. I had always wanted to name my daughter Eleni, but I had to have 4 boys before I got to use that name! (Then one more boy after her) I got myself your book for Christmas, I can't wait to open it. Congratulations on your pregnancy too! Having six kids is awesome, welcome to the club! Wherever did you find it? I love this post, of little things happening. Thanks for having me over for tea. What a sweet sweet doglet. I always enjoy your blogs, but today's just made my heart melt! I loved the entire thing! I'm sure Leo senses that you are pregnant...how sweet! I'm sure Theo and Bee would be right on your heels as well! Thank you for the visit! I always choose a tree that's reachign for our ceiling, too! OK, will you please adopt me???? I promise to bake you cakes...I make pretty ones, really....any flavor. I just adore your...everything, really. I am having such a rough day with my 4 kids, and your lovely post just swept me away from the constant chaos..for a brief moment. Thanks. And yes, I would love more tea. Your posts are always so beautiful. They make me smile every.single. time. 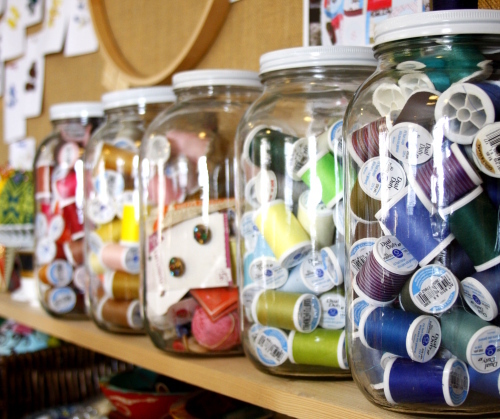 I love the jars you have up on the back of your sewing table. They look so beautiful. Much prettier than my multidrawer cabinet from Home Depot which is suppose to be for nails and screws and things. What did your family have to eat to get those great jars? i can't believe that we have the same exact tree topper! i made mine the first year my husband and i were married. gold leafed with little pearl pins stuck into each point. great minds think alike, or so i would hope. Beautiful cushion in your tree photo. Is it one of your own creations? hope yor Christmas preparations are going well. Love the picture of your shelf and cotton jars, I am about to embark on a sprucing up of my attic studio and love to absorb inspiring ideas and images. I have a Springer Spaniel named Tiller and he was super clingy when I was pregnant with my sweet little boy. He like to nuzzle and lay his head on my belly and seemed to think it was his job to do so every possible moment. Oh yes, more tea, thankyou! (actually i AM getting my more tea right now,) and thanks for sharing your works in progress. i'm in the middle of a pincushion with some of your yummy fabrics as we speak! have a lovely day and scratch leo's head for me! i love your pup's devotion. when i was pregnant with my twins i was on strict bedrest for 12 weeks. our german shepherd, mishka, never left the bedside. she must have been so sore from all the lying about. good dogs are priceless family members. First, I love the thread in jars! I've been struggling with thread storage and I am completely stealing that idea from you! Second, our pups were definitely changed by pregnancy and babies. The male was very protective and clingy when I was pregnant, then nonchalant once the baby arrived (to both me and the baby). But the female took on her role as surrogate den mother as soon as the baby arrived. She still sleeps outside her bedroom door when the oldest is napping. The female also gets upset with me if I let either cry too long. You should see her if I am sewing in the basement and just trying to get that last seam done when the baby has already woken from her nap. Pacing, whining, and running back and forth between me and the baby. That tree is just gorgeous in your living room, and I adore your daughter's little drawings next to yours! Very sweet. What a sweet December day! I love that adorable little sweater so much that I might just have to make the adult version. I can't wait to see more of the Good Folks collection! I don't have kids but I have heard about pets changing their ways when mommy is pregnant. Thanks for sharing your nesting moments! The last picture immediately makes me think of my dog, Maple. Wherever I am, she is. And if it's on my lap (she's small), all the better! Oh I love the sweaters. That's my resolution for the new year, learn to crochet and improve my knitting beyond knit 1, knit 2....makes adorable baby hats but that's it! Lovely to see your Chrsitmas house and hear what everyone's up too. Happy snow day! Happy Holidays! Leo has got to be one of the best doggies ever - so perfectly loyal and protective. Just LOVE him. I always get a smile or a new good idea when I come visit. Oh my goodness, on the dog question -- my Jack Russell Terrier (usually very hyper) became my constant companion on the couch. We have many pictures of her lying on my ever-growing tummy! Wonderful! We have a lab and a dachshund, but only had the dachshund when I had the babies. She was nutty/crazy with the first, but just seemed annoyed with the rest! 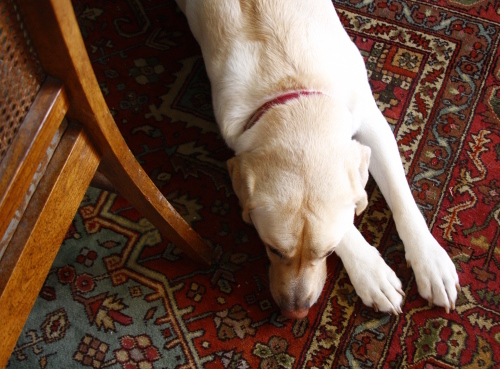 :-) (She knew what was coming) Our yellow lab, Duke, follows me everywhere now and I am definitely not pregnant..yet! He just knows who takes care of him! :-) Happy Holidays! Oh those sweaters are gorgeous! I agree I would love to see a pic with of the girls wearing them! On the pup front- I know what you mean -when I was pregnant with both my children I found my Hunter was more clingy than usual but in a more protective way. If I walked out of a room or down the stairs he had to make sure he went in front of me as if making sure everything was ok. He was also way more snuggly than normal too! It actually was kinda cute! Can't wait for your dress pattern to come out! I didn't know you crocheted! I have been addicted to it this past month... it's just the right evening activity to do while snuggling with the family! I am cracking up about the candy canes missing, as we have the same thief here too!!! Big hugs... I am so excited for your year! 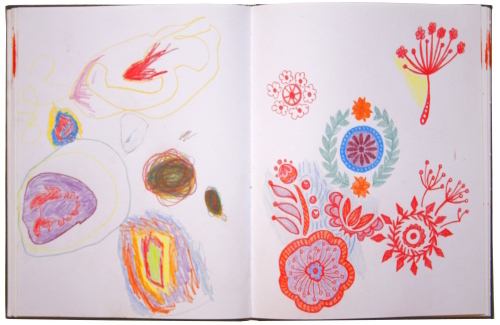 oh and I was really touched by the sketchbook... it reminded me of drawing with mine when they were that age! I'm going to cry a bit now!!! love you. What beautiful designs! What beautiful children! You are incredibly blessed. I found your site through Sommer Designs. What a find! Blessing to you this season and with your pregnancy. Looks like the holidays are in full swing at your place. What an elegantly and fun written peek inside what's going on over there! I agree with Vanessa, I always love the colorful pictures you post! May your life always be as bright and shiny! Congrats as well on the little bun in the oven, and I'm so glad you have such a faithful doting motherbear at your feet. That blue sweater is SO adorable. I might just have to cast on now. Now my friends just need to start having more babies! My mother's dachshund was so intent on sitting on her lap when she was pregnant that she worried he would jump up once she had me, so she started carrying around a doll to teach him that when she was holding the "baby," he wasn't allowed on her lap. He was a smart dog. I think he would have figured it out on his own, but I thought it was a cute way to train him. Congratulations on your coming baby. Being that I am totally in love with my 5-month-old (she's 3rd of 3 girls), I am just thrilled that you get to have another blessing, too! my marvin thought he was an essential part of the marination of my little one. he would lay right beside me, lay his head in my lap and lay his head on my stomach as if he thought there needed to be a little bit more warmth in there. he only flinched a few times at getting kicked. I adore this photo of your sketchbook. That's the same kind of thing that my mum used to do for me! Such good memories. And so cute that you had strict orders not to cross the middle line!! I hope you are still having fun with the pencils. I think I may have commented here before that I am absolutely addicted to them. I even have a funny looking finger now thanks to my terrible pencil hold!! Beautiful. Love your blog. Love all the COLOR. So rich & vibrant! Your blog and sense of style is great and very inspiring. I love the shade of pink on the wall with the fireplace. Do you mind sharing the shade. It's great! Thank you.